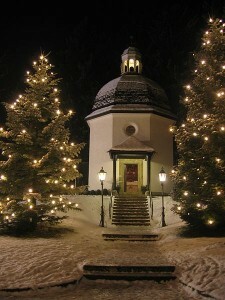 In Austria Silent Nightt is not heard until Christmas Eve, usually around 9 p.m. Then it is played on the radio once an hour and of course during church services. There are many renditions of this simple tune from simple solo to full ensemble. Gloria Estefan did a wonderful rendition for her Christmas album. She sings it in both English and Spanish.